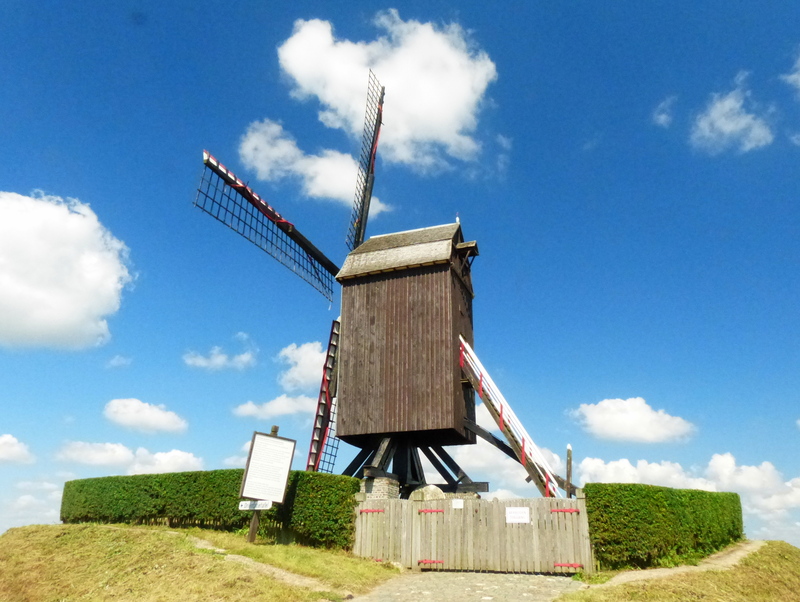 We were traveling through Belgium during a historically significant time. Almost exactly 99 years ago, German forces invaded neutral Belgium en route to conquer France in the opening moves of WWI. The Belgians refused to roll over to German demands for surrender, and they were summarily smashed, leaving supposedly siege-proof cities in ruins and the countryside ravished. However, the unexpected patriotic defiance of the Belgians helped stall the German advance, and even more importantly, partially forced the hand of the British to become involved, as defenders of the small country’s neutrality. This is a really too-condensed version of the events- Barbara Tuchman’s “The Guns of August” is a fascinating and quick read about the first few months which I highly recommend. 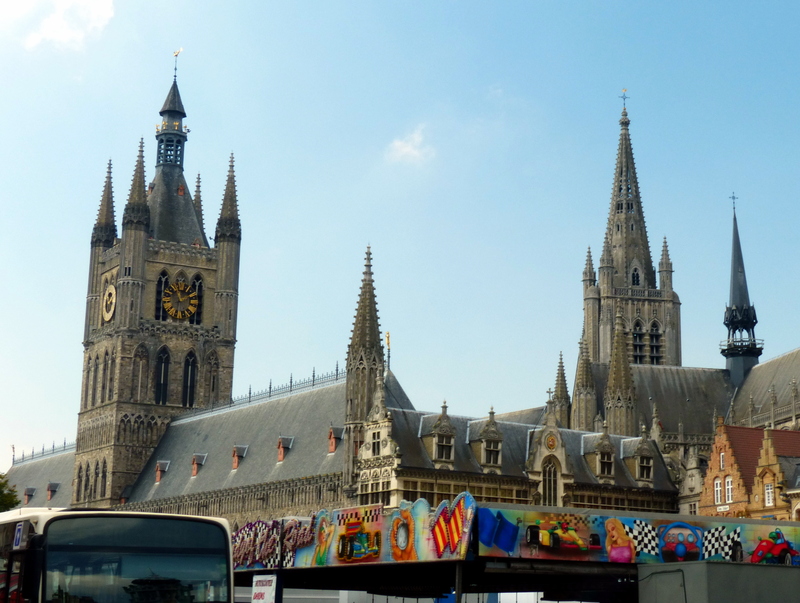 We were heading to the city of Ieper (Dutch), or Ypres (French), which was a strategic location on the Western Front. The British Expeditionary Force notably held off a German breakthrough attempt here in October and November 1914 before both sides dug in their trenches and the long years of trench warfare began. The city remained essentially on the front lines throughout the war as neither side was able to make any significant progress offensively. Persistent artillery shelling all but completely leveled the city. Today, the city has been rebuilt. There is a supposedly well done WWI museum in town and given the fortuitousness of our timing, there wasn’t a question of whether or not we would be going to the museum. First, we had to get into town. 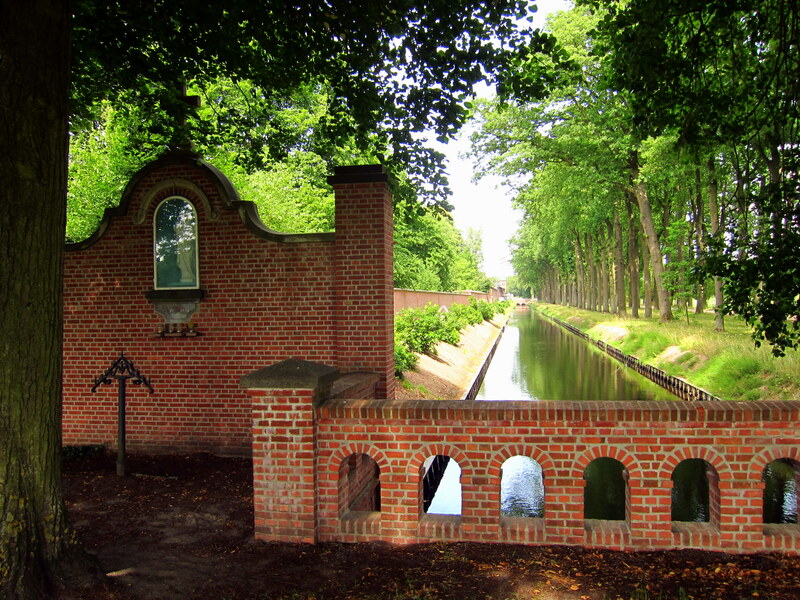 Our campground was within walking distance of the museum, but there was a large wall and moat between us and where we wanted to go. 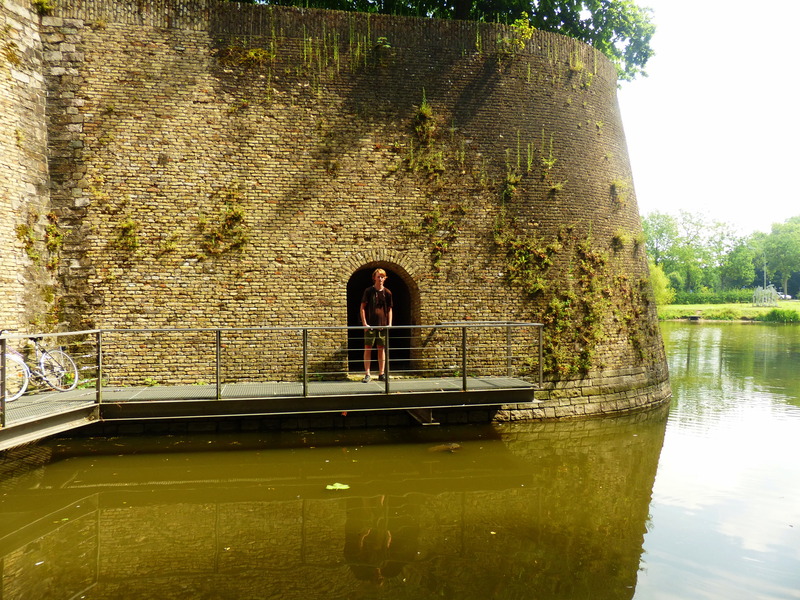 Ypres is an ancient city, with early reports dating back to the 1st century BC, so the moat wasn’t too surprising to find in the middle of town. We had a nice walk through town to reach the museum. 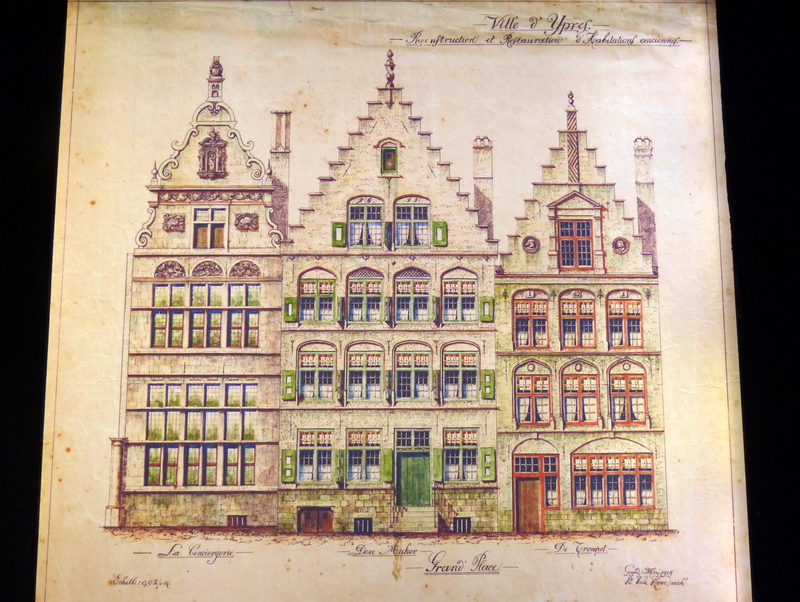 There are a number of old buildings, which seem typical of European cities now. 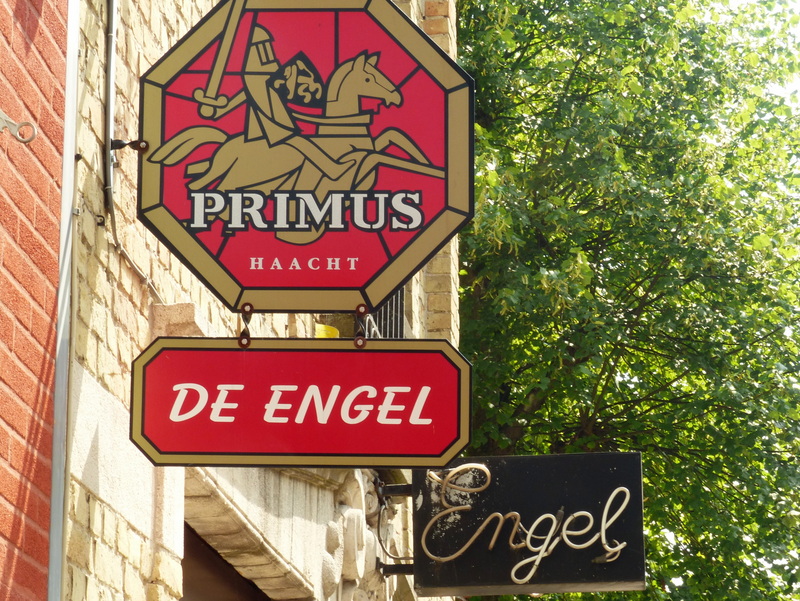 Apparently, the Flemish knew we were coming and named a restaurant or bar after us! The museum was really well done. It was pretty small, but absolutely packed with artifacts and information about the war in general, but with a focus, of course, on Ypres. Unfortunately, a majority of the displays were behind glass, so Jenny didn’t get a lot of pictures. The section on American involvement was small and tucked in at the end. I hadn’t fully realized it, but the US really only stubbornly entered the war towards the end. 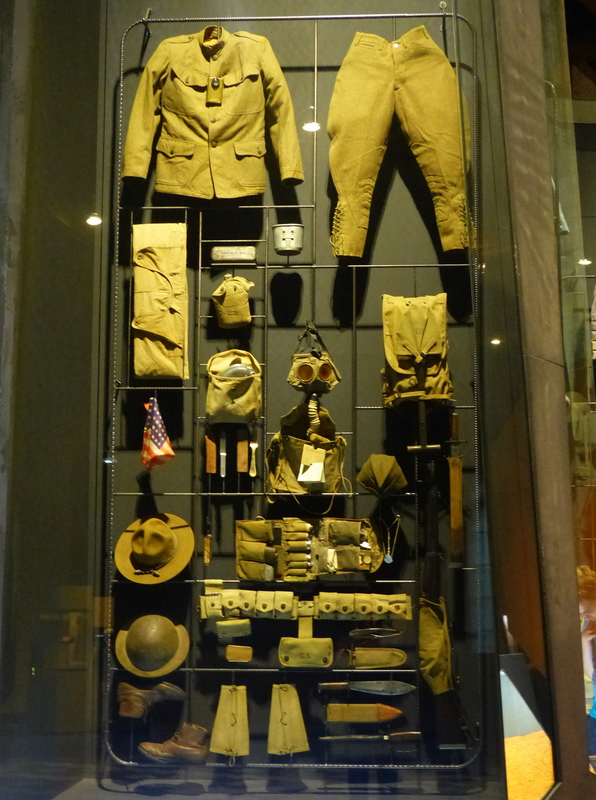 The abbreviated display seemed like a subtle reminder that although the American involvement was critical and decisive, the French, British, Russians and their allies bore the brunt of the horrors. 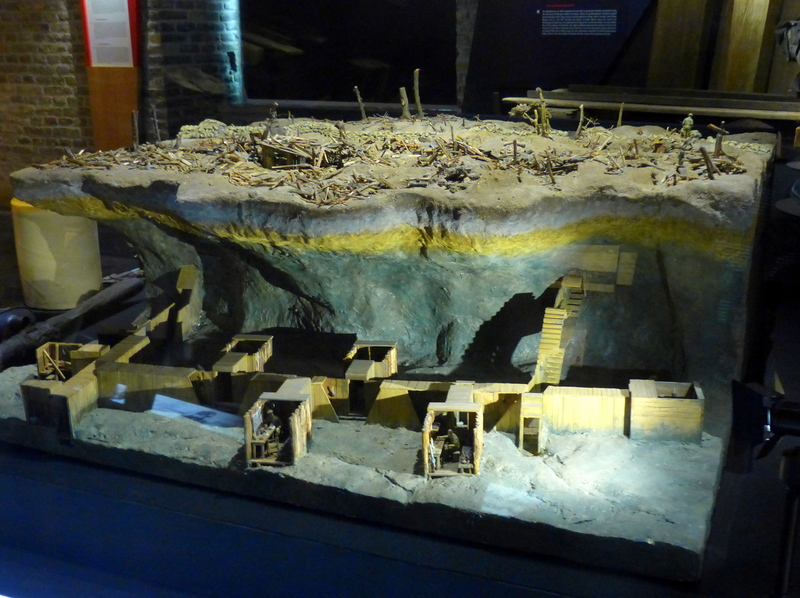 There was a fascinating display on the sappers, who built massive tunnel networks underground in order to place explosives to blow craters under enemy trenches. 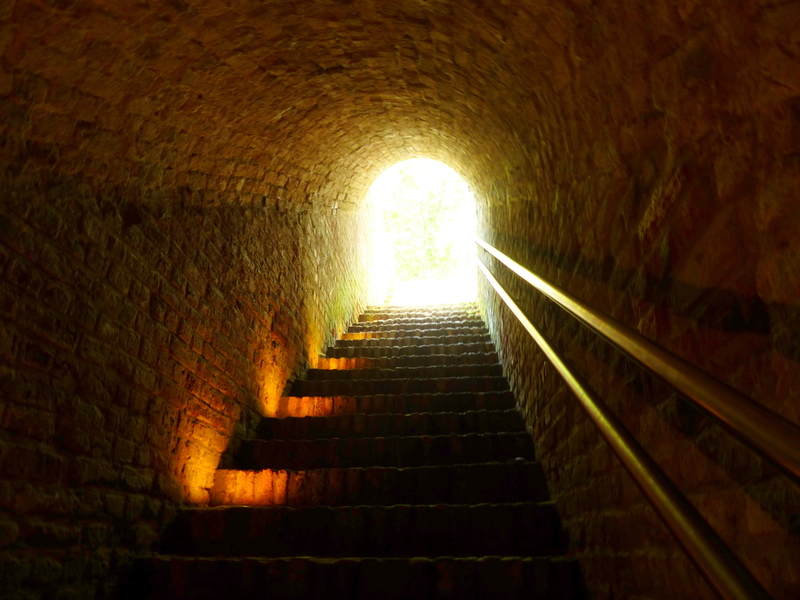 It brought to life some of the harrowing depictions of life underground found in Sebastian Faulk’s “Birdsong”, a book both Jenny and I read. 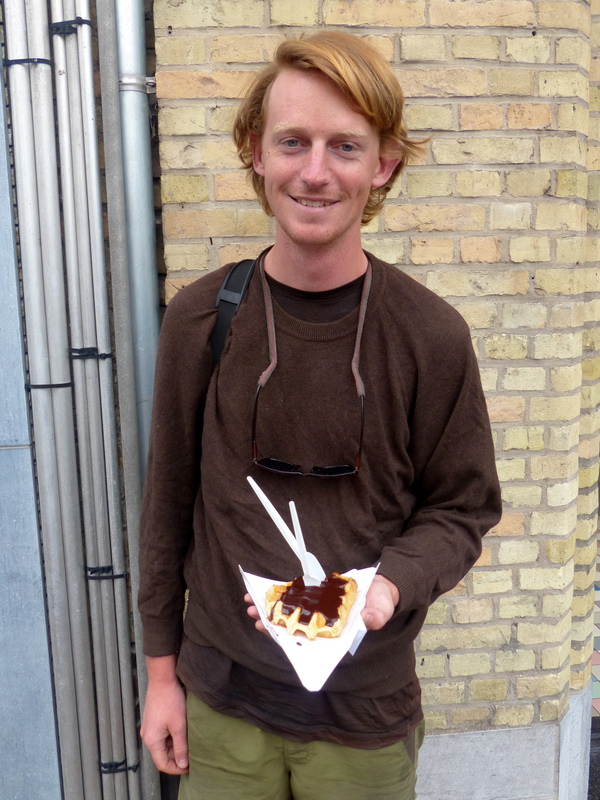 We planned to leave Belgium the next day, so we had to have a Belgian waffle covered in nutella. It was just as delicious as you would imagine. Rainy mornings make everything a little more complicated. 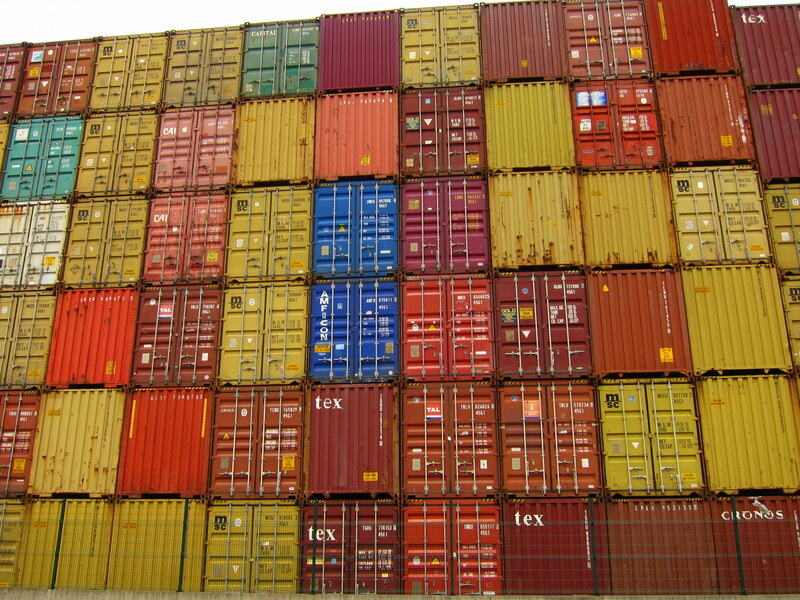 Packing up wet items can led to mildew and general funkiness. Plus, it is no fun putting your rear on a wet seat first thing in the day. So, waking up to a bright sun was just what we wanted. We were able to dry out the rainfly and our tarp while we made a cup of coffee. Things started out nice and mellow. 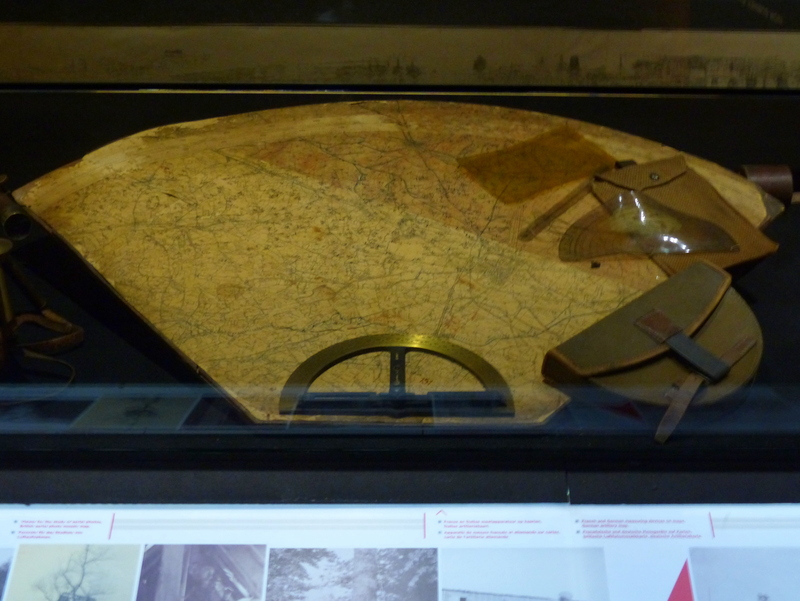 We were headed for Ypers, a city that was pretty much completely destroyed during WWI and now houses a renowned museum dedicated to the conflict. The cycling was easy with a few rolling hills. We passed through a couple towns, but everywhere feels a little depressed. Belgium appears to have been hit a lot harder by the financial crisis than it’s neighbors. We got a little excitement in the afternoon. As we were pedaling through a town, with vehicles behind and approaching us, there was a horrible sound and I was falling off the bike. The screw holding my seat onto the post had snapped in half. My seat and several pieces had gone flying in different directions and were scattered over the road. Somehow, I had received a huge bump on my shin too. Well, riding a bike without a seat is challenging. Considering nothing seemed to be open in Belgium, we had no idea what to do. The scene of the disaster was coincidentally in front of a bike shop, that was closed. We found a supermarket and hoped they would have a hardware section. No luck. 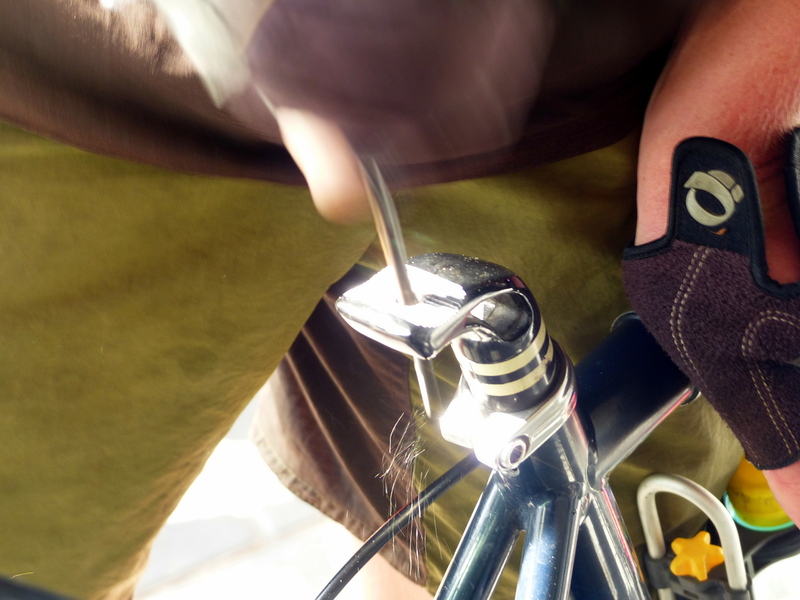 Chandler had recently replaced his broken seat post and still had the hardware from his old seat. We first attempted using his screws, but found them to be a size to big. So, he made the hole bigger by filing it with the threads of a spare axle skewer (he aspires to be a cross between Bicycle Repair Man-man-man and McGyver). But after all that the bolt was slightly too short. Finally, we just replaced my post with his old one. Now, my seat swivels with every pedal. Not ideal, but better than no seat. We made pretty good time to Ypers after the seat excitement. We weren’t really inspired to stop anywhere. If you haven’t already guessed, we weren’t real impressed with Belgium, especially after our lovely time in the Netherlands, which set a high standard. We more or less cruised directly to Ypers and found a campground within walking distance of downtown. Our neighbor ended up being an engineer from Canada, so we stayed up chatting a little later than intended. We woke up to a little drizzle and our camp neighbors dogs. Since I am always missing our dog, Lucy, I tried coaxing the dogs into our tent for a snuggle. I got one in for about 30 seconds before they ran off to their own people. It was at least nice to be around friendly and cute dogs again. The day did not go as planned. We were hoping to extend our time in Holland, but got caught in an terrific rainstorm. We spent a lot of time in our garbage bag skirts again. We made a few stops, hoping the the storm would pass over us, but we weren’t so lucky. Our first stop was for pizza, which was delicious. 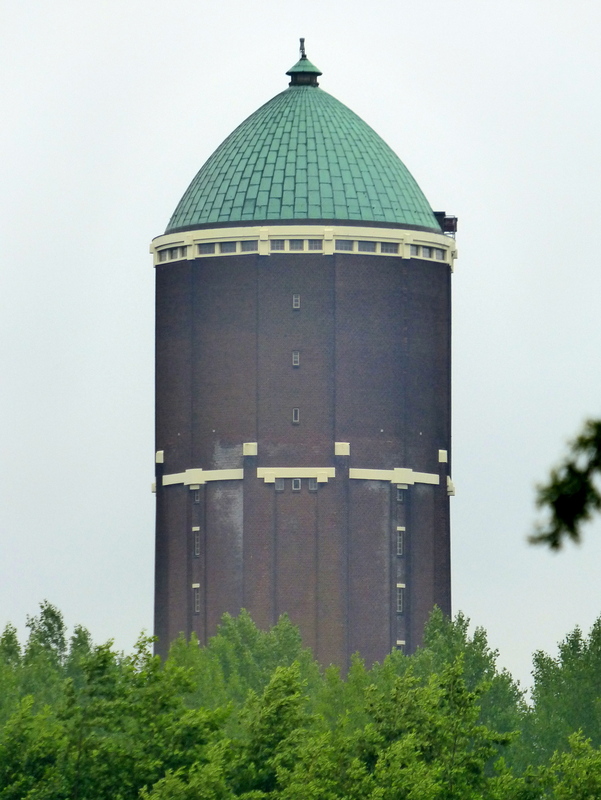 There second stop was to investigate the Axel water tower. 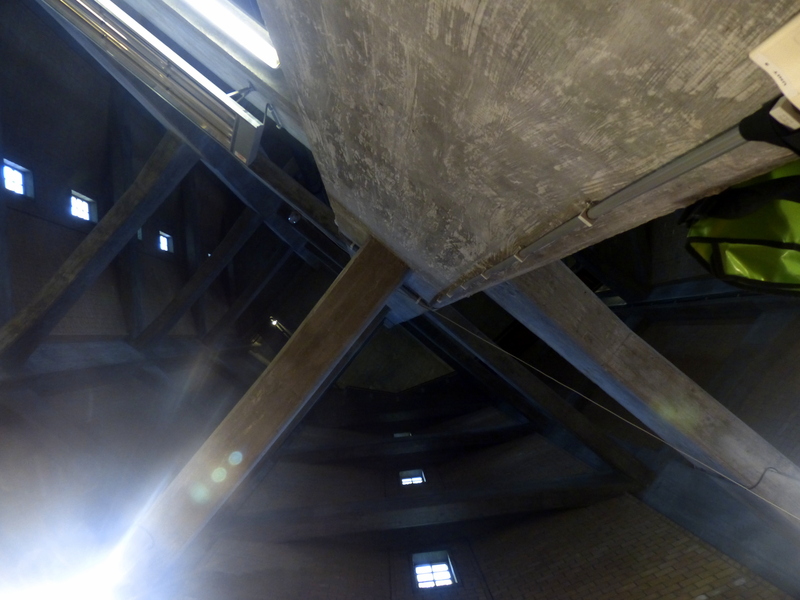 The tower is tall, like 60.6 meters tall, and visible for a long ways off. Chandler and I had a few guesses as to what the building was before reaching it and determining its use. 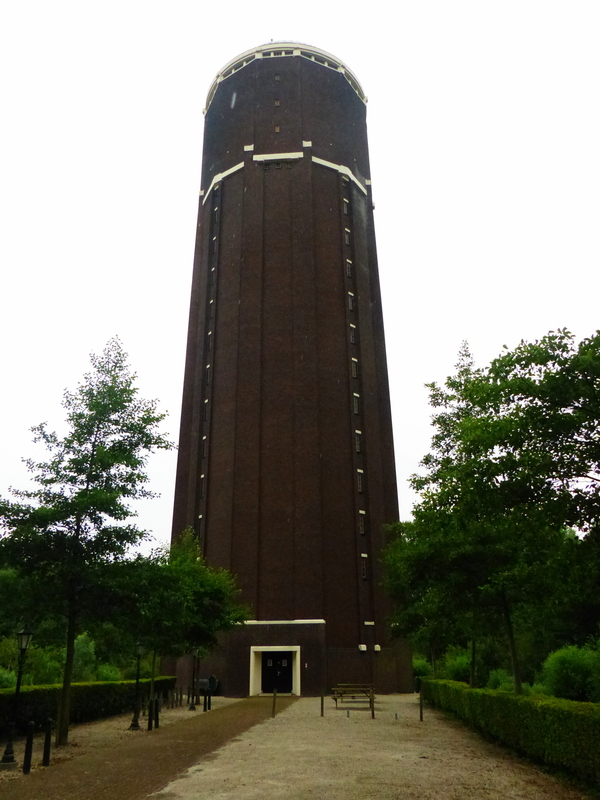 The tower was built in 1936, but has not been used for its designated purpose for a number of years. Today, it is used as an art exhibit, water resources learning center for kids and the roof hosts peregrine falcons nesting and breeding area. Wanting to get out of the rain, but more to see the falcons, we climbed the 250-odd steps to the very top. Maybe the falcons had the day off, because we didn’t see a thing. Unfortunately, since it was so cloudy, there wasn’t much of a view either. We tried to stay as long as possible, but eventually there was nothing left to see. We put our rain skirts and jackets back on and climbed back onto the bikes. The rain continued on and so did we. 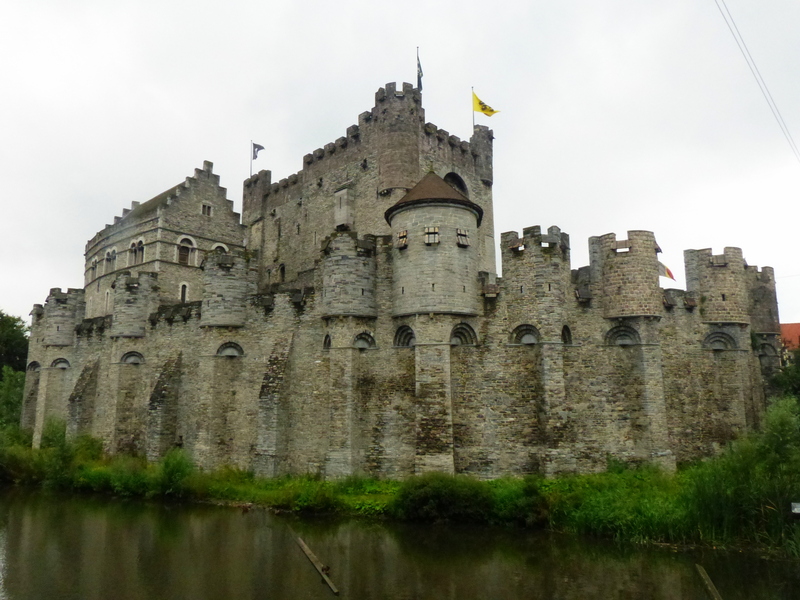 In the evening, it lessened to a drizzle and we could bring out the camera again, just in time for the Ghent castle. The castle was built in 1180, with a renovation in the 1880s, and looked like it was out of a story book. I almost expected knights to be patrolling the walls with maybe a princess or two that needed rescuing. 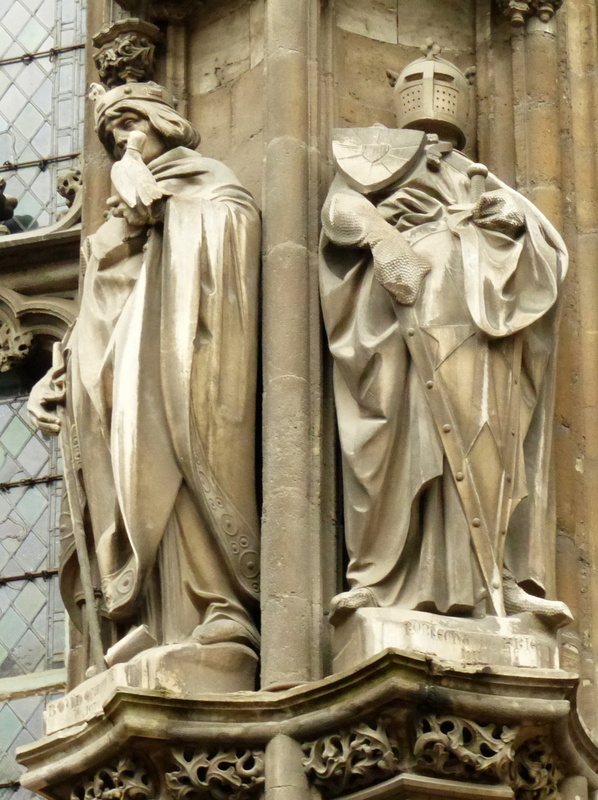 The city of Ghent had a lot of interesting, old architecture. We ended up seeing quite a bit because we got a little lost, or took the long way getting out of the city. 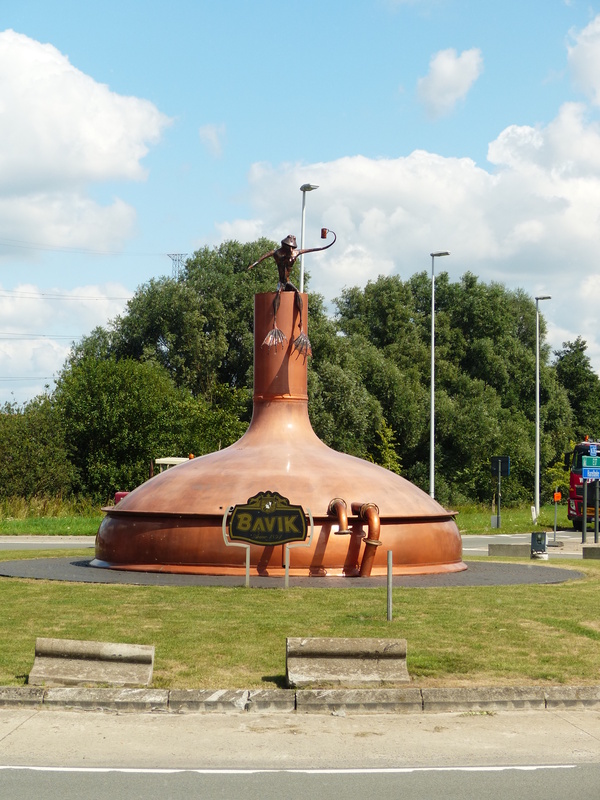 Belgium also has a few free campsites, apparently inspired by their neighbors to the north, so we planned on spending the night at one of those. 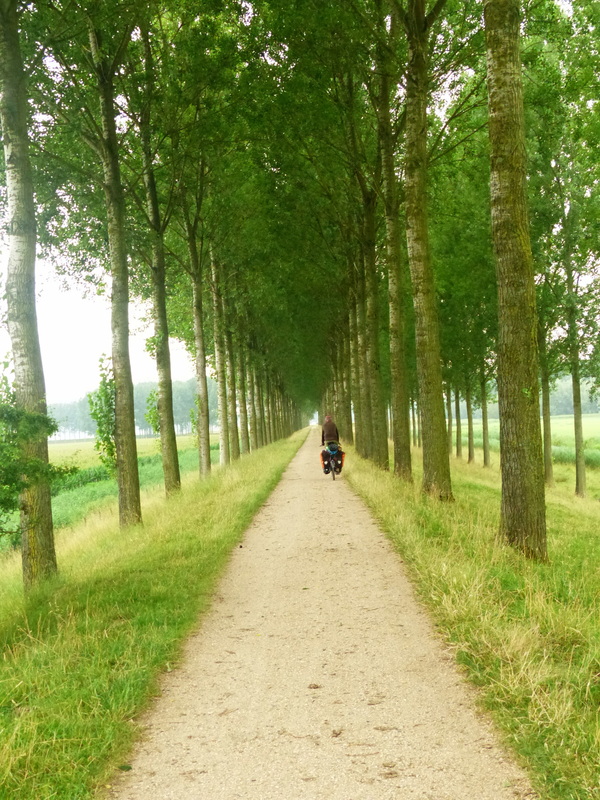 We found that Belgium is not as easy as the Netherlands… The bike paths sometimes just end leaving us on major highways with no shoulder. In some towns, all of the stores will be closed, even at 3pm on a weekday. The free campsites listed on websites sometimes do not exist. We ended up camping in the corner of a field tucked away from view. 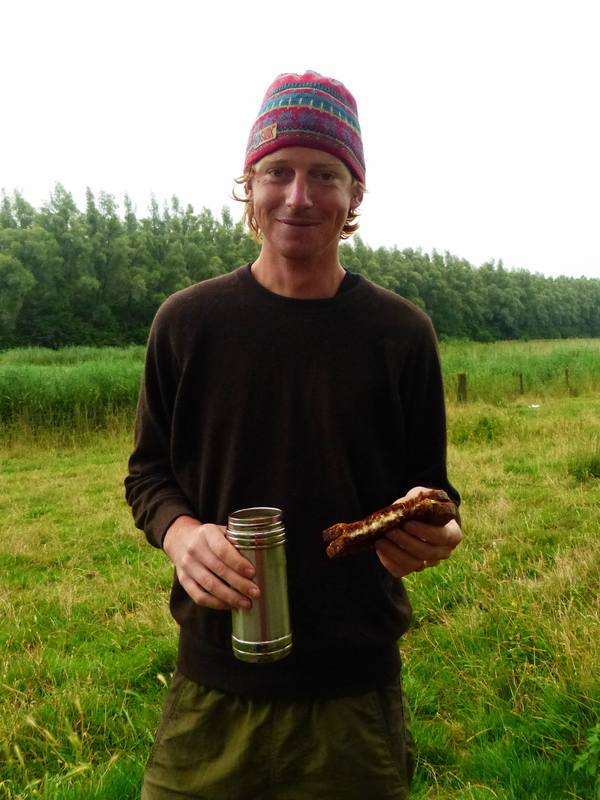 It was raining pretty good, so we just ate a quick dinner of crackers, cheese and beer and hit the hay. It was drizzling when we woke, but the excitement of a new country did not deter us from getting up. 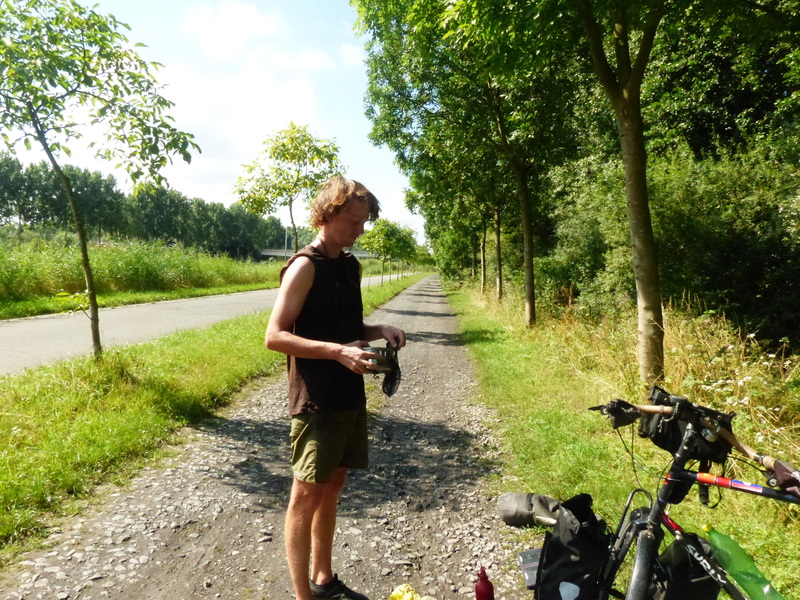 We were headed back to Holland for another free campsite, but we had to cross the greater Antwerp area first. 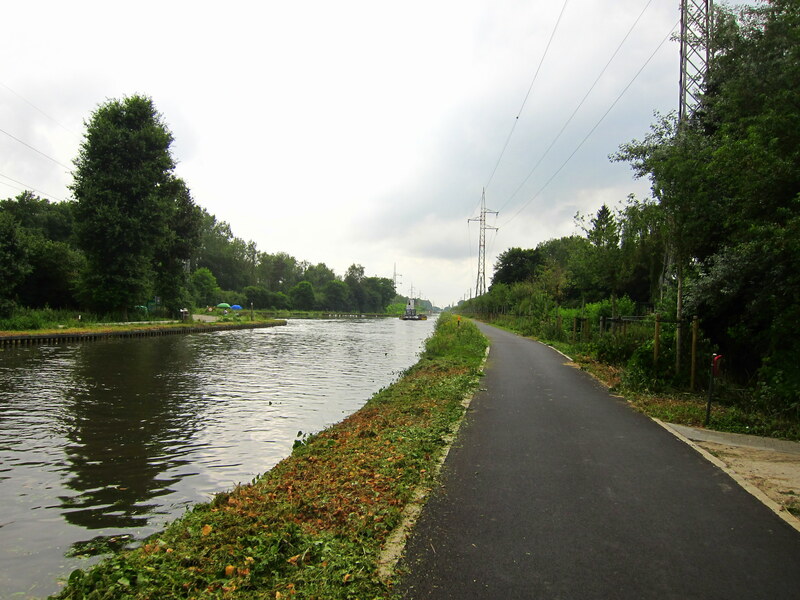 Leaving the campground, we pedaled along a canal, similar to what we had seen in Holland and enjoyed a lovely bike path. 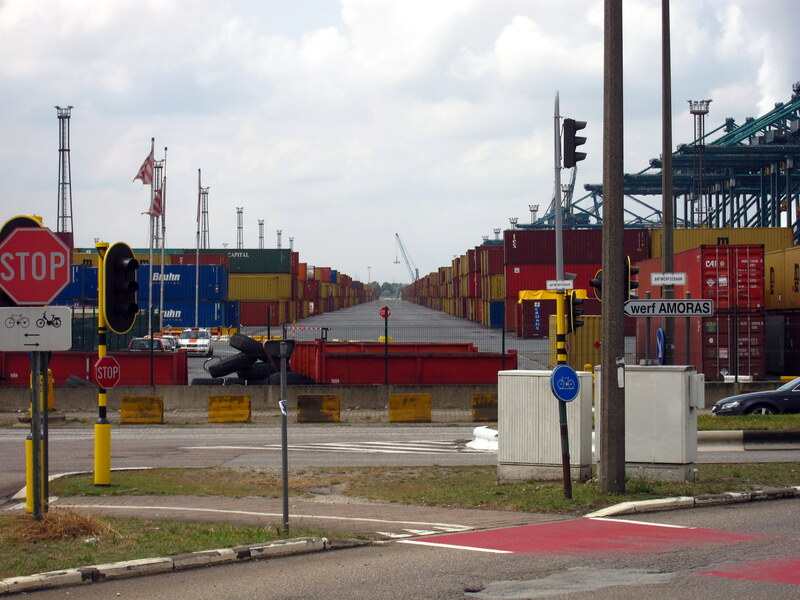 Our route quickly took us to the bustling port area near Antwerp. At first, everything was great. There was lots to look at and we met some fellows biking on their way to work. We had a great bike path, which was nice because there were a lot of giant trucks on the road. We rode along side the guys for a few miles before they turned off for work and the bike path merged with the road. This wasn’t a problem because there were bike route signs leading the way. Eventually, the bike route signs led us to a dead end. A friendly cyclist waved at us from another nearby road that we should go his way. We quickly realized we were in a complicated maze of drawbridges and locks. The traffic pattern was constantly in flux as ships moved through the locks and the bridges went up and down to accommodate them. We made it across the first bridge and were approaching the second, when the gates closed and the bridge went up in the air to let a barge pass, so we had to follow the canal until we found another one that was down. We made it a little further before being dead ended again. We scoured the GPS map for a while and saw that all the traffic crossed the huge waterway through a tunnel. We looked for a bike lane, pedestrian path, anything, but it quickly became clear this was a motor-only tunnel. The bike lane on the map showed that we should go over a railroad bridge, which didn’t seem like a good idea, but we didn’t have much of an option. So, we found ourselves waiting for at a closed set of gates in front of a raised railroad bridge. The road didn’t look very used, and there wasn’t any signage to indicate when or if the bridge ever went down. If the bridge didn’t go down we’d have to backtrack miles upon miles upon miles. Chandler and I HATE backtracking. We would rather go a hundred miles out of the way than retrace a few miles. We decided to give it 30 minutes before we gave up. 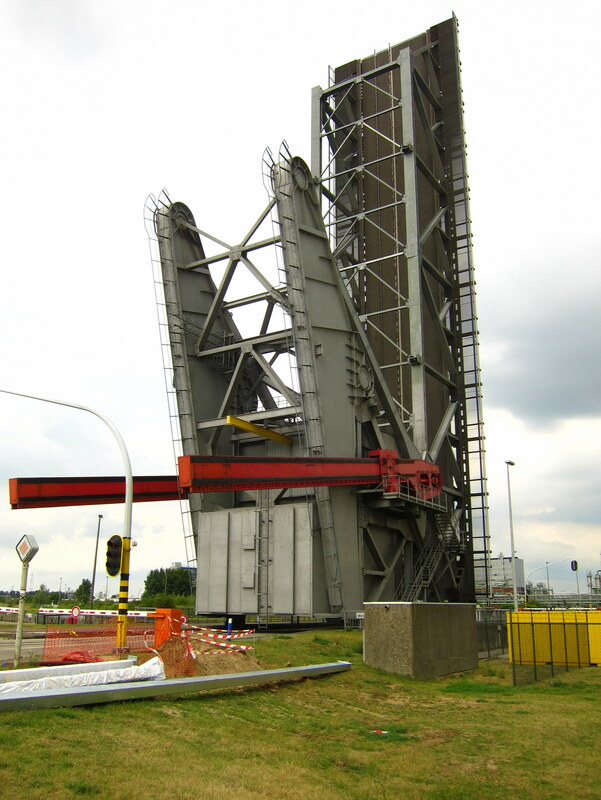 Thankfully, the bridge lowered right as the time was running out and disaster was averted. The railroad bridge turned out to be fine, we just had to be careful to avoid the tracks set into the pavement. We followed the bike route signs and ended up in a quaint little village. We looked at the bike route map and saw there was a bike ferry that would bring us to the other side to continue the route we were one. So we brought our bikes down to the dock and waited. And waited. And waited. We could see the dock on the other side and there was no one over there, and worse there was no ferry over there either. Chan walked back to land and spotted a tiny printout listing what he interpreted to be ferry landing times, on Saturday and Sunday. It was Tuesday. So we backtracked. 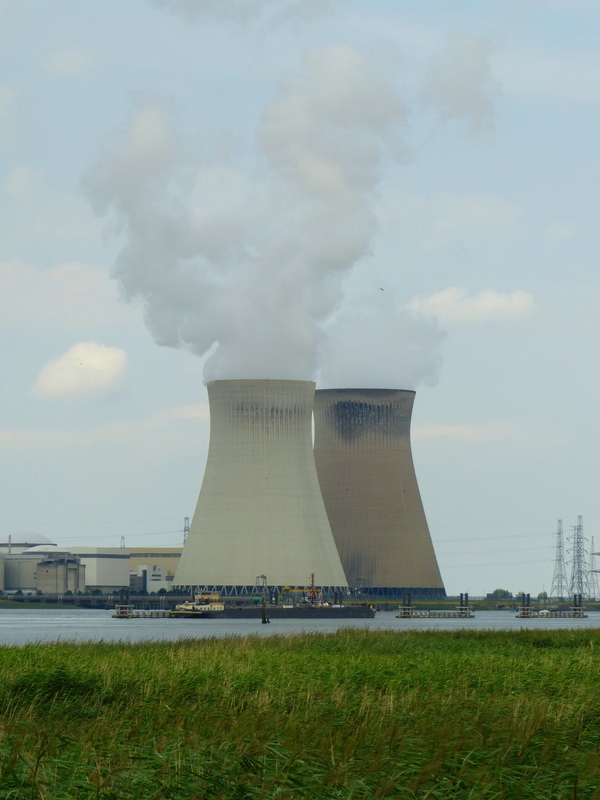 It wasn’t all bad, we got to see a nuclear power plant and ride through a bunch of industrial development, and half the bike paths were torn up since they were burying some sort of pipeline. Oh wait, that part was not fun. 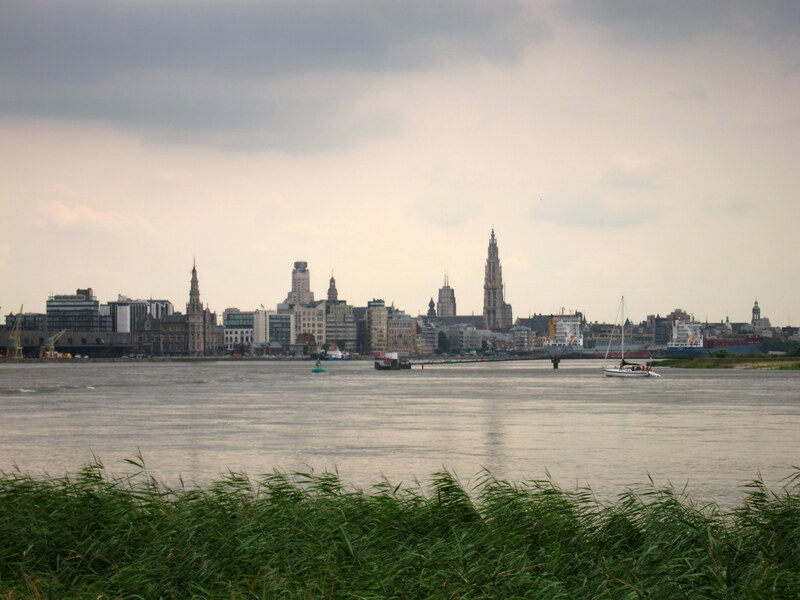 When we caught a glimpse of Antwerp we were both happy that we weren’t skipping it after all. The skyline was nothing short of stunning. After all the frustration, we were going to treat ourselves to pizza! 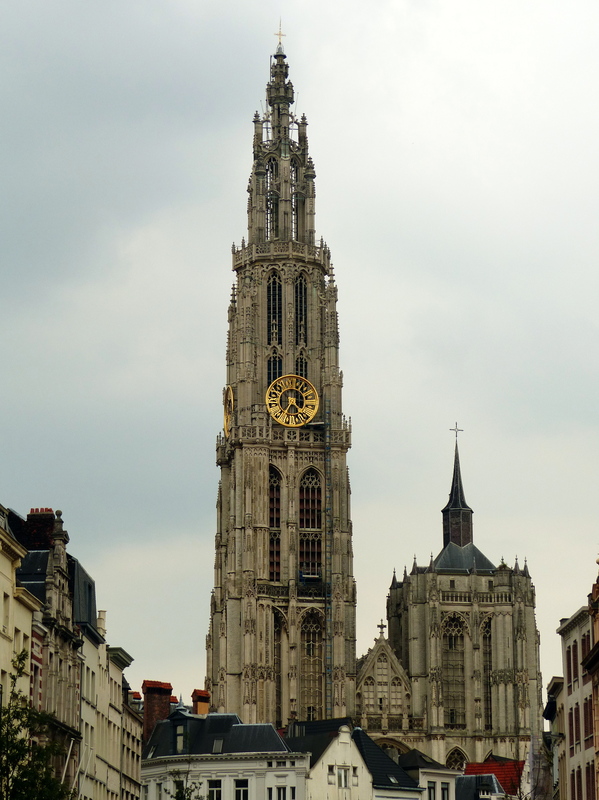 Antwerp was loaded with really cool architecture and seemed like a great place to lose a day wandering around. However, night time was creeping up and a hotel splurge not in the budget so we ate up and carried on. 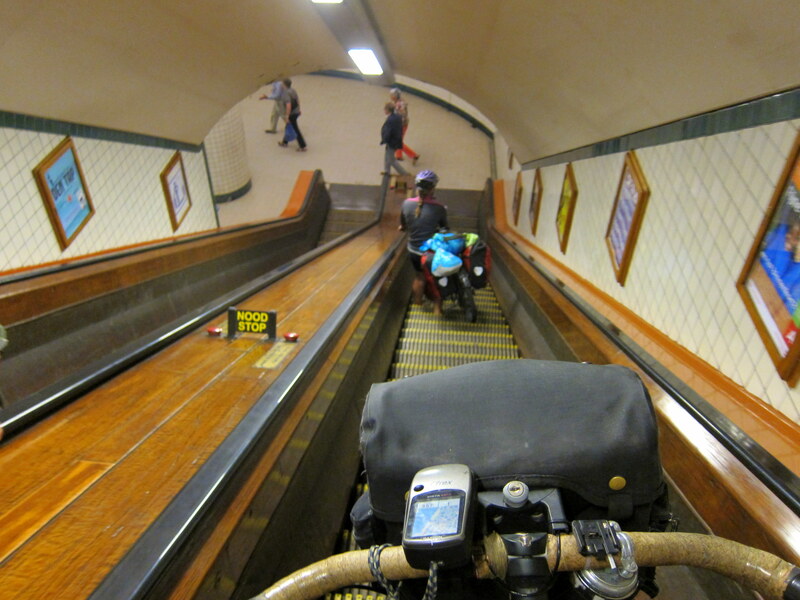 We had the interesting experience of taking our bikes down a very old escalator to access a tunnel. It was a little frightening as the bike is really heavy and I had to balance it while holding the brakes with a death grip. We were able to ride through the pedestrian tunnel leading from the city north under the waterway that had thwarted us earlier. We noticed a giant elevator on the other end and opted to take that than relive the experience in reverse. 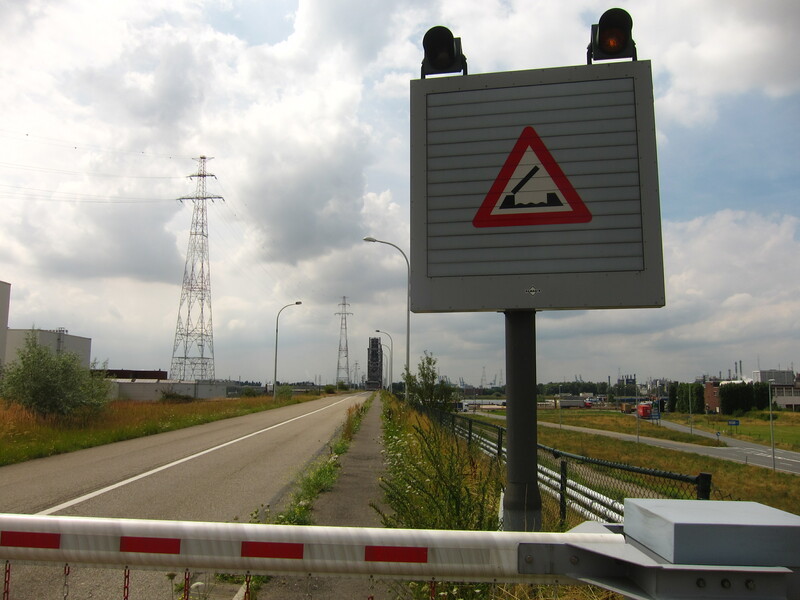 Once out of Antwerp, we headed just across the border back into Holland. There was another free campsite near an old fort. We arrived just as the sun was setting. It had been a frustrating ride, but we had kept our cool and saw some interesting stuff. We were glad to have another mellow (and free!) place to unwind and relax. A Belgian couple, who had spent the day geo-caching, showed up, so we were able to socialize a little. 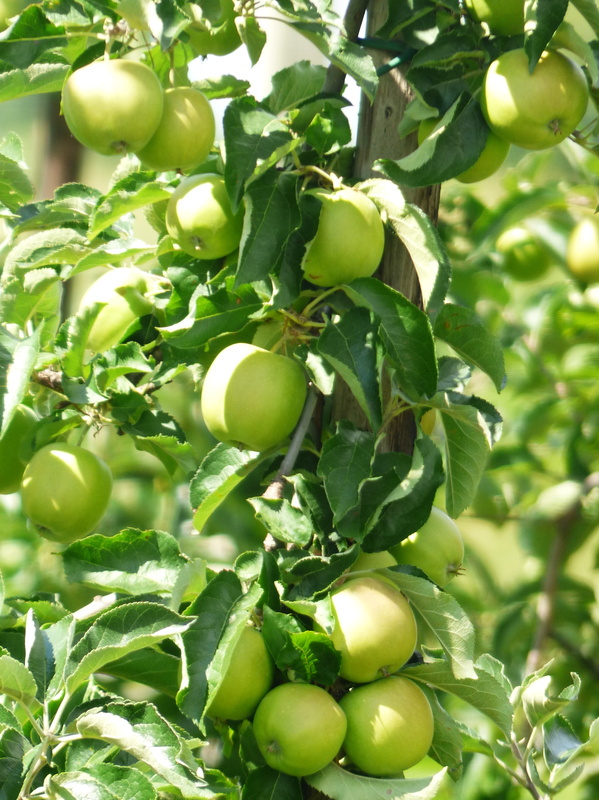 We woke up with the sun shining, in great moods and excited about the day ahead of us. 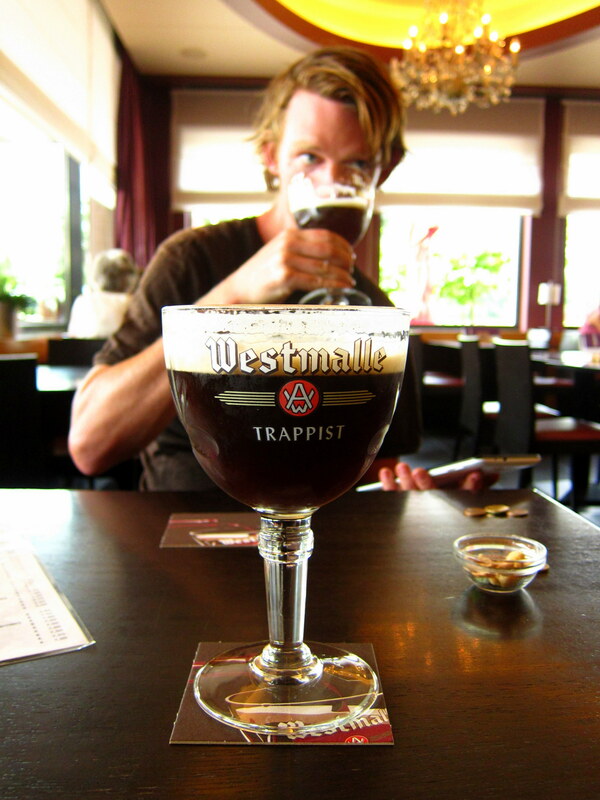 We were going to another Trappist brewery, Westmalle and the land of chocolate and waffles: Belgium. The road leading away from the campsite was covered in sand, making it slow going. Chandler was able to power through it, but I ended up having to walk my bike. Thankfully, the sand didn’t last too long. 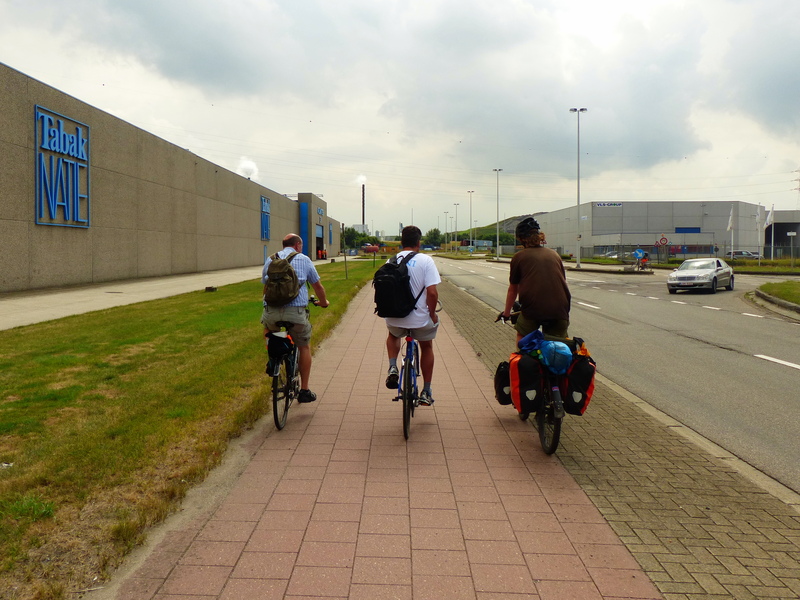 We crossed over into Belgium almost without realizing it, except that the bike path ran out and we were suddenly sharing the road with traffic. We also noticed a small section of a tall electric wire fence. 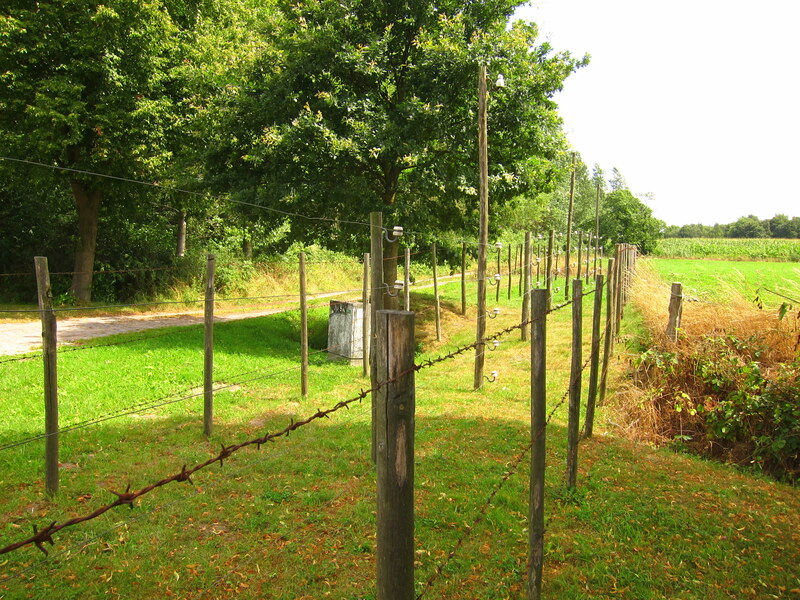 This barrier, called the Dodendraad or the “wire of death”, was installed by the Germans during WWI to prevent Belgians from escaping into neutral Holland. The fence was electrified with 2000 volts to ensure instant death. The fence we saw was a replica and a visual history lesson. It definitely served as a reminder to us that we were in an area that had been witness to a major war. After our history lesson, we continued on to the brewery. The monastery did not allow visitors, unless you were making a purchase. So, since most monasteries in the area make their own beer, cheese and soaps, we figured it was time to buy some cheese. We rode up to the building and rang the doorbell. A little old woman answered the door and ushered us into an office. While Chandler purchased the cheese, I was able to scope the place out a little by asking a nearby monk if we could fill our water bottles. He immediately took me to a spigot in a courtyard with statues and manicured grass. I was hoping to see more, but its was more than most get. They didn’t sell beer at the monastery, but there was a nearby official cafe. This place was a little more low key, and reminiscent of one of those tacky, generic brunch restaurants in the US. So the atmosphere was a little weird again… The beer was pretty tasty, but boozy and pricey enough, that we only enjoyed one each. Chan got a blend of the tripel and the dubbel (which they called a half and half) which was nice, but we couldn’t help feeling a little disappointed with our so far rather anticlimactic pilgrimage to the home of Trappist beers. 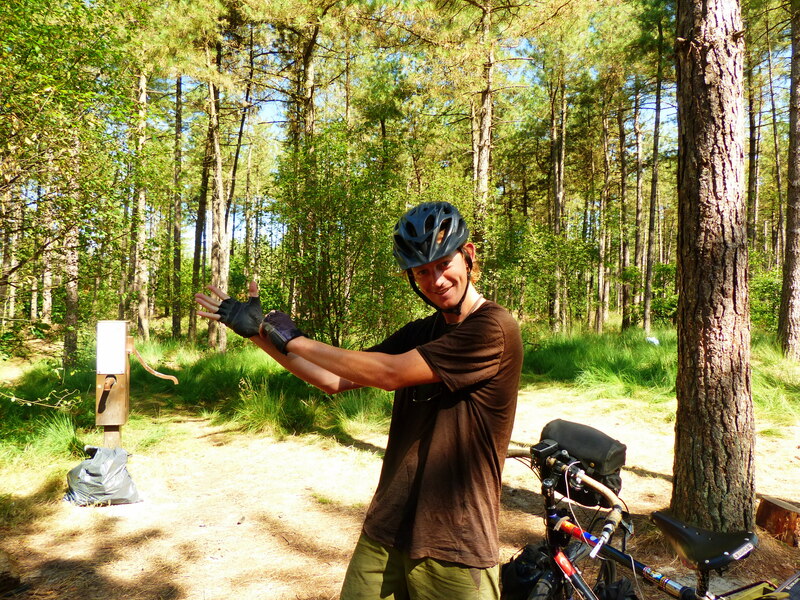 We called it an early day and cycled to the nearest campground. It turned out to be affordable and have an area for just tents, with everyone being a cycle tourist! We spent the night chatting with several of our neighbors late into the evening.